We invite you to join us at Laticrete’s Hydro Ban Shower System demonstrations being hosted at all Genesee Tile locations. We will be featuring Laticrete Hydro Ban Board. Food and refreshments will be provided. Contact your Genesee Tile representative or call one of our locations. HYDRO BAN® Board is a lightweight easy to handle and ready to tile wall board designed to be used in bonded tile or stone installations. It is made with a high-density, waterproof extruded polystyrene core and a reinforced, waterproof membrane on both sides to give triple protection from water and vapor intrusion. 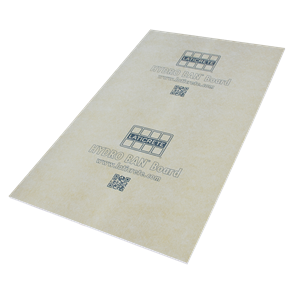 HYDRO BAN Board can be used on walls, floors, ceilings, and in many installations requiring dimensionally sound and stable substrates as well as in steam rooms and steam showers. HYDRO BAN Board does not contain cement, fiberglass or paper products and will not cause itching or create messy cement debris during installation. No tab washers are required for floor and wall installations when using the ceramic coated HYDRO BAN Board Screws.